“The real agenda is migrants’ rights in Greece which include issues of religion,”Â We want this officer put on trial, and we ask the government to protect our prayer sites in Athens,” said Zuri, a Moroccan protester. Â “But we intend to set a good example and refrain from violence,Â Islam is a religion of peace,” he said. Migrants’ rights? What rights do illegal immigrants have in Greece? Why should they have any? They are not supposed to be there. They have broken the law. They should be promptly expelled or imprisoned. And those immigrants who, while they perhaps are not illegal, but support those who are, through their violence and attempts at intimidation, clearly making war on Greek people and on the Greek nation-state, its political and legal institutions, its customs and manners, should be stripped of citizenship as well, for clearly they are a permanent threat to that state and its people. No more nonsense need be tolerated. Things will only get worse. Stop them now, and let Greece, in its firmness, and Italy, it its firmness, by their actions, be a model fror the rest of benighted Europe. A classical model for dealing with such enemies, one handed down from time of antiquity. . It is, almost certainly, the most important speech of his presidency. On Thursday Barack Obama will address the Muslim world from Cairo University. And no one quite knows what he is going to say. There is speculation, of course. Last week the Arab press was a-twitter over Obama’s last-minute decision to visit Saudi Arabia en route to Egypt. Was this a swipe at Egypt? Did it signal an endorsement of the Arab peace initiative? Or was it the usual American brown-nosing of the royal autocrats who have all that oil? Does Obama really think that strong-arming a reliable U.S. ally about these settlements will end the jihad against Israel? Or does he just not care, and is willing to throw Israel to the wolves? “When the American administration talks about Israel’s duty to stop the settlements – including natural growth – it is a very important step,” noted Abbas…. Yes, it is. And in no sense one that free people should applaud. About Obama’s upcoming Cairo speech, one Afghani lawmaker says “One speech will not work, but it’s good for a start. When youÂ pay homage to others and respect them, you enliven their spirit.” In short, the world’s Muslims are waiting to see ifÂ Obama’s “symbolic” prostrationsÂ will morph into real prostrations, unwarranted concessions. White House: Obama Will Visit Mosque After Speech to the Islamic World…. * ZIP: Because it did wonders for Bush’s popularity in the Muslim world…. The erasure and denial of 3,000 years of Jewish history in Jerusalem is integral to Palestinian ideology. Accordingly, Israel and Jews are said to have “no rights” to Jerusalem, and any contemporary manifestation of Jewish life and development there is labeled by the Palestinian Authority as “Judaization.” Jerusalem is presented as an exclusively Muslim and Christian city, with no regard for historical reality. Beyond this historical revisionism, the PA disseminates the libel that Israel is acting to expel Arabs from Jerusalem in order to further “Judaize” the city. Fabrications include PA accusations of Israeli destruction of Islamic and Christian sites, and repeated use of PA hate language, including references to a “criminal cultural massacre” Â to chase Arab inhabitants away. The Jerusalem libel is designed to evoke religious hatred by portraying Israel and the Jews as the enemy of, and threat to, Arabs and Islam. OIC: "Islamophobia a Clear and Present Danger to Global Peace and Security"…. * Of course it is! What could be worse than resisting the Islamization of (our) infidel countries? At its core, Islam is a religious mission to all humanity. Muslims are religiously obliged to disseminate the Islamic faith throughout the world. We have sent you forth to all mankind” (Q. 34:28). If non-Muslims submit to conversion or subjugation, this call (dawa) can be pursued peacefully. If they do not, Muslims are obliged to wage war against them. In Islam, peace requires that non-Muslims submit to the call of Islam, either by converting or by accepting the status of a religious minority (dhimmi) and paying the imposed poll tax, jizya. World peace, the final stage of the dawa, is reached only with the conversion or submission of all mankind to Islam. Muslims believe that expansion through war is not aggression but a fulfillment of the Quranic command to spread Islam as a way to peace. The resort to force to disseminate Islam is not war (harb), a word that is used only to describe the use of force by non-Muslims. Islamic wars are not hurub (the plural of harb) but rather futuhat, acts of “opening” the world to Islam and expressing Islamic jihad. Relations between dar al-Islam, the home of peace, and dar al-harb, the world of unbelievers, nevertheless take place in a state of war, according to the Quran and to the authoritative commentaries of Islamic jurists. Unbelievers who stand in the way, creating obstacles for the dawa, are blamed for this state of war, for the dawa can be pursued peacefully if others submit to it. In other words, those who resist Islam cause wars and are responsible for them. Only when Muslim power is weak is temporary truce (hudna) allowed (Islamic jurists differ on the definition of temporary). OIC: “Islamophobia a Clear and Present Danger to Global Peace and Security”…. Abu Dhabi, 30 May 2009 (WAM)Â –The Organisation of Islamic Countries (OIC) Observatory on Islamophobia released its Second Annual Reportcovering the period from June 2008 to April 2009 today at the commencement of the 36th Session of the Council of Foreign Ministers in Syria. The OIC newsletter, a copy of which was received by WAM, said the report has dwelt extensively on the worrying trend of Islamophobia as a clear and present danger to global peace and security. The Report clearly lays out the sound legal basis in terms of the international law of the OIC’s case on defamation of religions, particularly Islam, as a form of racism. * Which race is Islam again? I keep forgetting. Please help me! The BBC has offered Â£30,000 and an apology to the Muslim Council of Britain after airing accusations that it encouraged the killing of British troops. The corporation offered the settlement after aÂ Question TimeÂ panellist accused the council of failing to condemn attacks on British soldiers in Iraq and Afghanistan. Charles Moore, a former editor ofÂ The Daily Telegraph, made the comments on the programme in March during a debate about Islamic protests at a soldiers’ homecoming parade in Luton. He claimed that the council thought it was a “good thing, even an Islamic thing” to kill troops. * Of course they do. THEY can say that. But the kuffar must not say that; what’s the world coming to, you Islamophobe, you! Charges Against ‘New Black Panthers’ Dropped by Obama Justice Dept. * Â Obama’s personal Mau Mau thugs. How could he not support them? * Atlas Shrugs:Â OBAMA ATTACKS FREE SPEECH – FREEDOM LOVERS WAKE UP! * F*kc the natives! Lets replace them with our own Muhammedan proletariat! 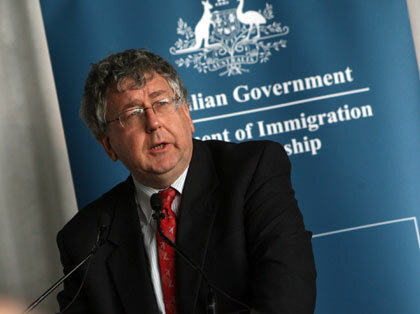 THE National Audit Office is investigating the influence the federal Labor MP Laurie Ferguson may have exercised over the Immigration Department in securing money for two projects in his electorate. Poor documentation of how migrant support services were awarded extra money after last year’s budget led the audit office to recommend more transparent decision-making. Â The abuse suffered by those who stubbornly cling to their faith in lands conquered by the Religion of Peace. Doesn’t that sound familiar? But remember: Islam being such a mercy to all humanity would never forcibly convert a kuffar. What were you thinking, you Islamophobe, you? Gitmo Jihadists to be resettled in Australia? * Why would KRudd’s Ostraya accomodate them when no state in the U.S. will have them? The Federal Government is considering a request by the United States for Australia to resettle detainees from the Guantanamo Bay. It is the third request by the US but the first to be made by the new President Barack Obama. The detainees are 17 Uighurs, who are Muslims from north-western China. A Pentagon report in February called for them to be urgently released, but the US Government fears they will face persecution if they return to China. A spokesman for Kevin Rudd says the Government will consider the request on a case-by-case basis.